In 2018, whenever you hear a racist deny that they’re racist, there’s often some variation of a frequent line that pops up: “I have a black friend!” “I have a black boyfriend/girlfriend!” “I voted for a black president!” The list goes on and on. It’s a scenario that often plays itself out in real life conversations regarding race, and is a topic that is explored in a hysterical and over the top fashion in Dirty Linen, the latest full-length play to be presented as part of Manhattan Repertory Theatre’s New Play Production program. Written by Nigerian-born playwright Ofem Ajah and directed by Artistic Director Ken Wolf, the play explores a situation that starts off in a laundromat – as one might guess from the title – between two friends and an insensitive comment that leads the recently divorced Hannah (portrayed by Elizabeth Officer) to go to extreme lengths to persuade her friend Tasha (portrayed by Taylor Carter) that she is not racist by finding a black man to be her next husband…thus leading to a series of events involving Tasha’s husband Abel (portrayed by Derek Keeton) that only show just how low Hannah will go to prove a point that seems hardly true. At first, the play starts off less funny and more awkward, with the typical cringe lines such as “I just want to listen to white music, not black music” followed by the defensive “I voted for Obama twice” that prompt laughter that feels uncomfortable, more than anything else, perhaps because of how used to it we might all be, at this point. There are also some lines and situations that initially feel unrealistic (at first glance, why would Tasha believe some of the things Hannah would say, after her comment toward the beginning of the play?) but are later made clear toward the end of the play, after a major plot twist. However, it gets much stronger, as the play unfolds. Much of the initial conversation proves to be crucial for some of the most hilarious moments that occur later in the play between Hannah and Abel, as is the excellent physical comedy of the cast, which is just as much an important part of this production as the dialogue filled with equal amounts of political and sexual humor. It all builds up toward the ultimate punch line of an ending. While I won’t give it away, those final moments are ultimately the best part of this very funny script, which is made all the better by its strong cast of actors who bring it to life. While the run time is relatively short, at just under one hour, it manages to keep your attention without dragging on, and gradually gets more and more funny from beginning to end, as it builds up to its climactic moment. We need more comedies like this, which aren’t afraid to explore cultural issues in a thought-provoking manner, while still being able to maintain a spirit of farcical craziness that often make so many comedies as entertaining as they are. If you have the chance this coming weekend, be sure to stop by Manhattan Rep, and see this gem during one of its last performances while you can. 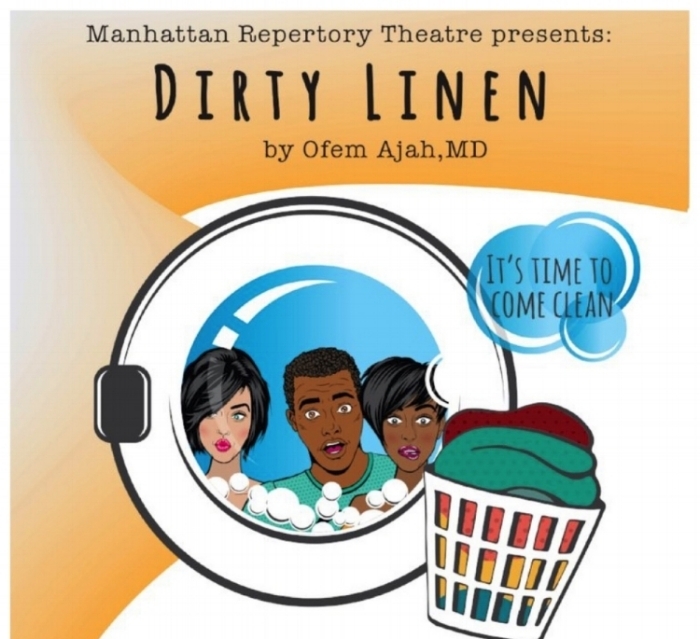 “Dirty Linen” runs at Manhattan Repertory Theatre from September 13th to October 6th. For more information, please visit www.manhattanrep.com.